Using your laptop in the car is not really the easiest thing in the world to do. 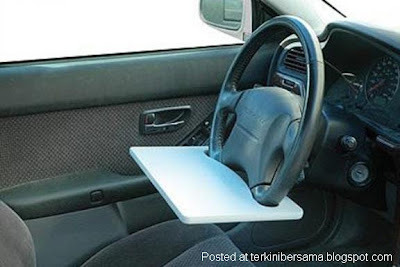 While many car manufacturers are including iPod and mobile phone docks in their new vehicles, nobody’s really putting laptop stands in cars. But for the traveling business person, using a laptop in your car is essential part of today’s business environment. The Laptop Steering Wheel Desk Laptop Steering Wheel Table can help to facilitate using your notebook computer in the car.